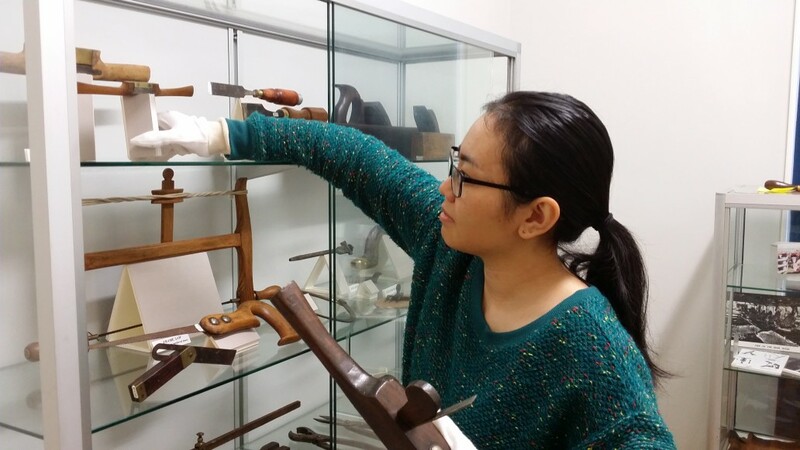 Recently Alexis Tay teamed up as intern with the Willoughby Museum. Alexis is currently in her final semester in the Masters of Art Administration at UNSW Art & Design, and in order to complete that qualification Alexis required a placement of 240 hours in a gallery, museum or arts related organisation. Have a look at what she got up to. “Having completed half of my requisite placement hours last year as an Exhibition and Administration Assistant for Cultivate New Artisans, a contemporary garden-inspired art exhibition at Sydney’s Royal Botanic Gardens, I decided to complete the rest of my hours at a museum. Coming from working with bright, creative and eye-catching contemporary artworks to handling historic artifacts and antiques in a small museum provided a vastly different learning experience. Willoughby Museum is a Federation brick cottage, named Boronia and built in 1913. The museum’s objective is to conserve and interpret the history of Willoughby and the contribution made to its development by its residents. There are four core themes: local industries and working lives; domestic life; towns, suburbs and villages; and immigration and ethnic influences. On display are objects dating from the 19th to mid 20th century such as tradesmens’ hand-tools, clothing, toys, kitchen appliances, pottery and furniture. Collection management: examining, researching and entering the facts, provenance and condition of new display items into the MOSAiC database. Exhibition design: Redesigning some of the permanent displays. Exhibition development: Planning and preparing new displays for the upcoming war exhibition. Social media: Setting up a Facebook page and managing its contents and posts. One of the biggest issues for small museums is the difficulty they have in attracting adolescents and young adults as audiences, or as members. This in turn means that participating in social media and using new technologies presents challenges. Social media has an important role as a marketing tool and has the potential to attract younger people into the museum. So in December I started the Willoughby Museum Facebook page. The main idea behind it is to establish an online profile that will promote the existence of the museum, its services and membership in NSW and worldwide. We’re currently using it to post interesting photos, news and events that will hopefully engage younger people in the activities and collections of the museum. It provides an online forum where dialogue of Willoughby’s history can be exchanged between its Facebook followers and the volunteers who run it. The internship has given me experience and knowledge to become a museum attendant/curator, but I have also gained an appreciation and understanding of Willoughby’s local history and the way it has shaped the city and its residents. I encourage everyone – young and old – to visit not just the large, famous museums but their local museums too, as it can teach them a great deal about their town’s past. And here’s what Margaret, one of Willoughby Museum’s long time volunteers, had to say about working with Alexis. Clearly she brought more than just social media skills to the mix. “Alexis was a fresh set of eyes and hands for the museum! She reminded us of safe handling procedures for objects entrusted to our care, as well as the significance of levels of lighting for preservation and conservation. Having someone to instigate the museum’s social media presence, enter object records into the database and facilitate the multimedia presentations of our WW1 piano music recording, took a lot of pressure off us. So why not tally up the things your museum needs help with, including the new skills you need to learn and contact a university near you?